There is a smidgen of good news: 6,000 more South Africans were employed in the formal sector in the last quarter of 2015 than in the same period a year before. But even the man in charge of collecting the country’s statistics calls this “insignificant”. With a number of data collection drives on the go, Statistician-General Pali Lehohla on Wednesday appealed for doors to open to Community Survey 2016 fieldworkers in the Western Cape where, despite awareness campaigns, “we are not doing that well”. By MARIANNE MERTEN. Gathering statistics from households selected for Community Survey 2016 is meant to provide municipalities, but also government more broadly, with the necessary information on residents, their ages, education standards and other details to plan infrastructure development, meet housing needs and ensure access to basic services. But it seems the survey of 1.3-million households countrywide is struggling to get past the first hurdle in the Western Cape where more doors have remained shut than open. It is hoped this situation will change over the next month before Community Survey 2016 ends on 22 April. This is just one of a number of headaches for the statistician-general, who has again taken to wearing a canary yellow suit to promote the community survey as he did with Census 2011. And Wednesday wasn’t a particularly good day. After Statistics South Africa (Stats SA) announced that inflation has crept up to 7%, significantly above the target range of 3% to 6% set by the South African Reserve Bank (the Bank), Lehohla had to tackle employment statistics with the quarterly employment survey (QES). It’s complicated, and intricately tied to definitions and data collection methodology. South Africa classifies unemployment as being able, willing and actively seeking work, but not having a job. The expanded definition of unemployment includes those too discouraged to even try find work alongside those studying or doing unpaid work in the home like caring for the elderly or children. There’s the quarterly labour force survey (QLFS), which measures overall employment in all sectors including agriculture, small businesses and the self-employed. And then there is the QES, which focuses only on the payroll of VAT-registered formal businesses, excluding agriculture, and those who run their own businesses. Wednesday’s QES release showed that in the last three months of 2015, a total of 6,000 more people were employed in the formal sector than in the last quarter of 2014. That increase was driven by the trade sector, financial and business services and community services, which effectively is government employment. Formal employment growth in these sectors made up ever so slightly on the year-on-year job losses in mining (29,000), construction (19,000), manufacturing (5,000) and transport (6,000). Fourth quarter job statistics are tricky because extra people are hired for the festive season. The long-term QES graph shows similar year-end employment spikes since 2013. The notable exception was the second quarter of 2014 when employment rose to 9.1-million, but then there was an election for which the Electoral Commission of South Africa hired thousands of temporary workers. The QES showed about 8,992,000-million South Africans were formally employed in the last three months of 2015. The country’s total working-age population is 36.1-million (aged 15 to 64) from among a total of 54-million residents in the country. The latest available QLFS, which includes agriculture, small businesses and the self-employed, for the third quarter of 2015 showed an unemployment rate of 34.4% under the expanded definition, including those too discouraged to even try to find work and those studying or doing unpaid work at home. But the picture of joblessness can be made to look a little prettier in statistical terms if the numbers are limited strictly to those unemployed: that’s 25.5%. In terms of warm bodies, those QLFS numbers mean that of the 36.1-million South Africans of working age, 15.8-million are employed in one form or another in either the formal or informal sector, 5.4-million are without a job but looking, and 14.9-million are not economically active. 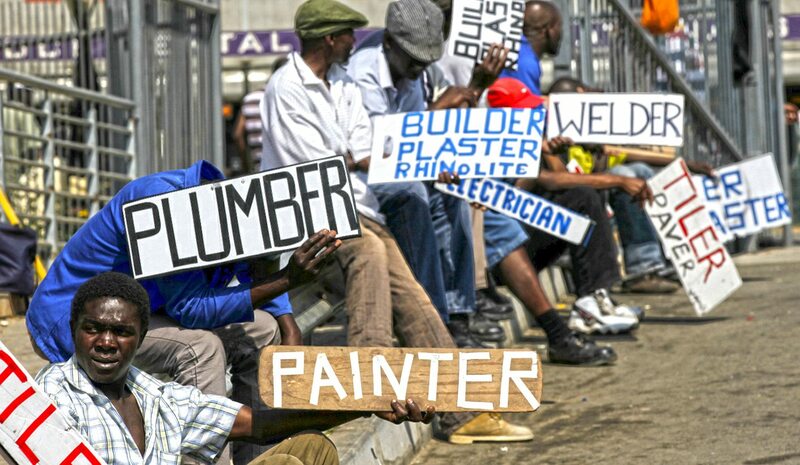 Trade unions generally cite the expanded unemployment definition as a truer reflection of socio-economic reality in South Africa. According to SARB statistics, in 1999 the unemployment rate was 23.3% on the strict definition, and 36.2% on the expanded definition. One of the factors arising from Wednesday’s QES release, if compared to October 2015’s QLFS, is the impact on numbers made by jobs in the agricultural sector, now hit by the worst drought in decades, and small businesses, whether survivalist hawking or professional enterprises.